Steve had the great honor of receiving the Farmer Mentor of the Year award from the Northeast Organic Farmers Association last Saturday. Except, he didn’t actually receive the award. When his name was called at the award ceremony in Concord, NH, an awkward silence followed. Steve wasn’t there. At that exact moment, Steve was tracking down a runaway calf a mile up the road from the farm. 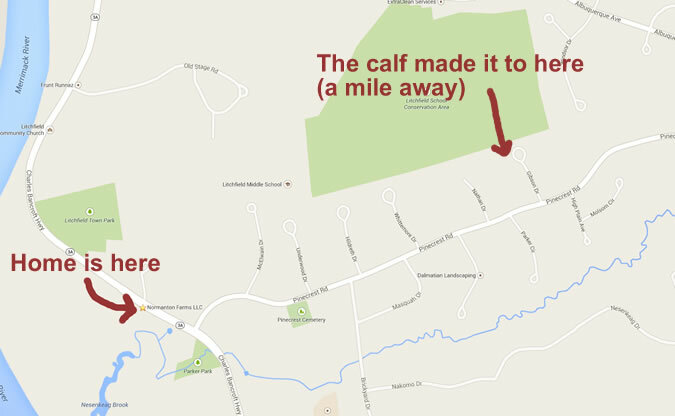 The independent-minded calf led Steve, the Litchfield police, and a handful neighbors and friends on a tour of the Litchfield School Conservation Area before finally giving himself up. The things Steve will dream up to avoid public speaking!